L to R: The Flower (Arkem Mark Walton), and The Little Prinxes (Lottie Vallis, Krishna Istha and Jo Jackson). 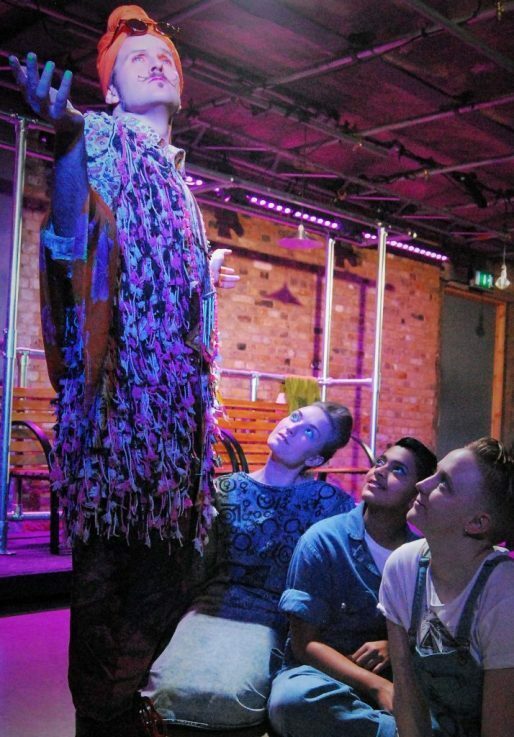 After Arcola Queer Collective’s stellar adaptation of A Midsummer Night’s Dream last year, I was thrilled to be in town for the remount of their version of The Little Prince at London’s Arcola Theatre. Creatively adapted by Nick Connaughton from the book by Antoine de Saint-Exupéry, and deftly co-directed by Connaughton and Rubyyy Jones, the piece is a magical gender-queered reinvention of a classic. As a disabled person with mobility and exhaustion issues (and a penchant for independent, lower-budget and LGBTQ+ theatre), I’m not used to finding venues I can get into and move around comfortably. Kudos to the company for choosing a home with helpful staff, affordable tickets, level access, and a lift to the bar and accessible toilet. I was disappointed, though, that they printed their programmes in illegibly tiny font on paper one quarter the size of an A4 page. 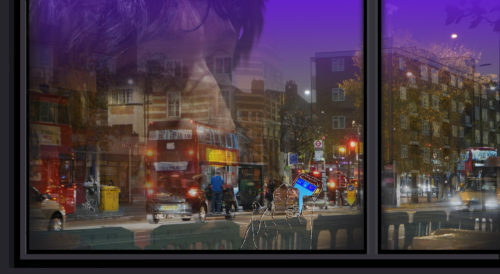 Arcola could also de-gender their toilets, and offer BSL and captioning (and promise to never store chairs in the lift again, ahem), but in general the venue is an oasis in a desert of inaccessible and hetero/cisnormative smaller theatres. Connaughton’s reinvention of The Little Prince includes casting three actors as ‘The Little Prinx’, which has the powerful effect of adding multiple layers of personality and interpretation to the main character. In addition, every character in the play is referred to with the gender-neutral pronoun, ‘they/their/them’. This choice can offer non-binary, agender, genderqueer and/or trans audiences (and performers) a rare chance to experience characters who represent them – and perhaps give others a bit of a gentle education about assumptions. Thus a familiar story is in some ways turned on its head, playfully examining non-gender and gender variation, as well as potentially moving some characters from one binary to another in our imaginations. Although in theory the tri-casting of The Little Prinx is intriguing, the script and direction of the three actors do not entirely succeed in creating three different elements of The Prinx. I found myself wondering if the device was necessary, or perhaps if it could be improved by having each actor play a separate, uninterrupted portion of the script (perhaps with the other two actors present but unspeaking) – so that each third would show a more distinct unfolding of character development. Regardless of this hiccup, it was still a worthwhile experiment – and Prinxes Krishna Istha, Jo Jackson and Lottie Vallis are enthralling to watch, as is the rest of the ensemble. Connaughton’s script is often funny, and Jones’ new choreography to silly songs perfectly suits the over-the-top comic tone of the play. Lydia Cawson’s costume design is at times drool-worthy and gorgeous; their denim and glitter combos, combined with clever directorial homages to dyke, drag and leather/fetish personalities, are the visual highlight of the show. The mustachioed yawn and delightful diva stretch of The Flower (Arkem Mark Walton) is perfectly echoed as their petals transform into a gown of roses. Later, Cawson dazzles us by dressing The King (an enchanting Damien Hughes) in a stiff yet flowing garment of crackling nylon red-white-blue bags. The Little Prince has less diversity and range than A Midsummer Night’s Dream, but there’s a sweetness and beauty to the production that sparkles like the metallic blue of the ungendered/multigendered hero’s eye shadow. Like The Little Prince, Arcola Queer Collective is young and full of wonder, and theirs is definitely a journey to follow.